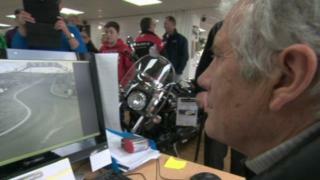 Italian motorcycling legend Giacomo Agostini watches footage of his 1968 Ulster Grand Prix win for the first time since the victory on the Dundrod road-racing circuit. Murray Walker provided commentary for the race, one of seven won by Agostini at the Ulster Grand Prix. Agostini's amazing record includes 122 grand prix victories and 15 World Championship titles.